Merry Almost-Christmas everyone! 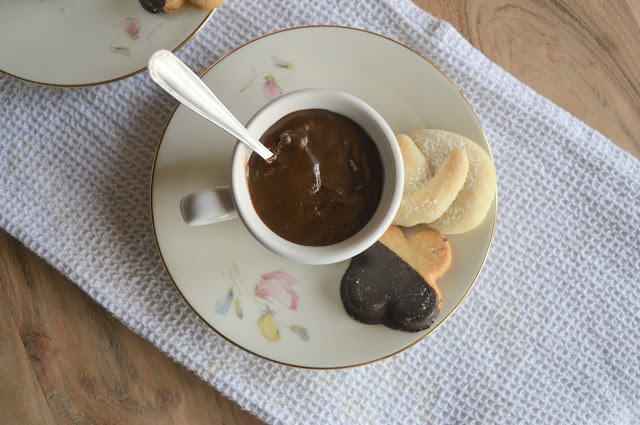 If you're still in full-on baking mode -- I certainly am -- here's a final cookie recipe to add to the mix, which seems especially appropriate given cookies are after all the treat of choice for Santa himself, no? I'm still excited for Christmas as a 28 year old -- how can you not be excited about a time of year whose official food is gingerbread and hot chocolate?! -- but my excitement is nothing compared to that of the Francesca of 20+ years ago. December was a whirlwind of emotions for my tiny self; I was anxious to find out if Santa would remember to bring me my much coveted and highly popular Furby; I was curious to see whether or not Elliot M., the meanest kid in the class, would wake up to a stocking full of coal; I was slightly worried that we would accidentally happen on Santa on our way home from the Christmas Eve evening mass our family attended, leaving him no choice but to escape before leaving all our gifts. Mostly, though, I was incredibly excited, and my favorite task in the midst of all the excitement (future foodie and baker that I was to become) was setting out snack for Santa and the reindeer. I opted for Keebler M&M cookies -- my favorite cookie, hopefully up to Santa's standards -- and baby carrots for the reindeer (I'd heard carrots were good for the eyes, and they needed to see in the snow). I arranged it all on our nicest Christmas plate, and placed it with care by the fireplace, a little to the right so Santa wouldn't step on his snacks on his way out. The next morning, the fact that Santa had also opted for the same wrapping paper that my mother had bought this year occurred to me, but was quickly forgotten in the whirlwind of gift opening. Indeed, there was no day more magical, mysterious, and thrilling for me then December 25th. I learned a a year or two later of course that it was my dad who ate the cookies (my mom took care of the carrots and apples). 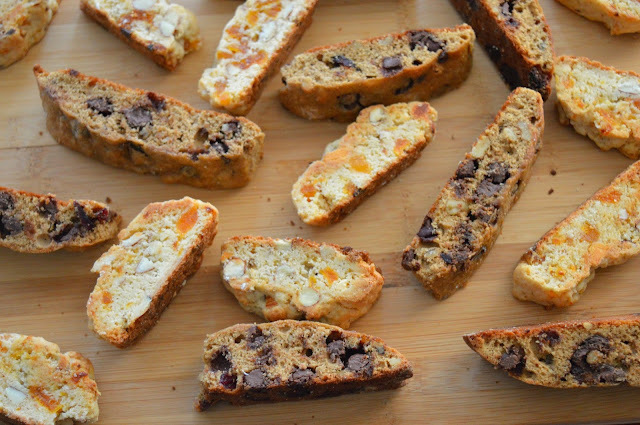 Had I known what I know now, I'd have left out these White Chocolate, Almond, and Apricot Biscotti, which match up far better with my dad's sophisticated taste buds (I can't imagine he enjoyed the Keebler's cookies all that much). 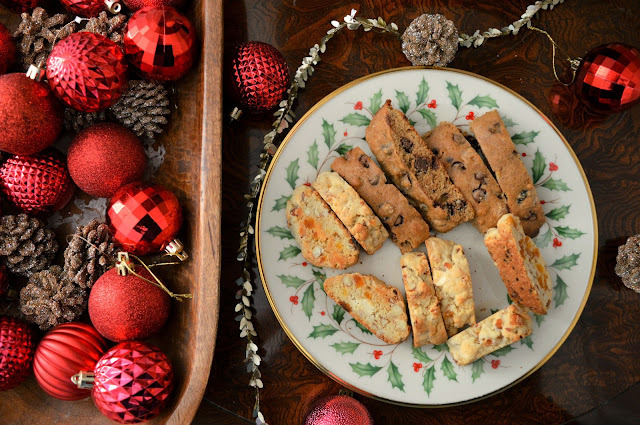 These biscotti -- which go by the name cantucci in Italy -- are cookies in their Christmas best, elegant and festive, full of crunchy almonds, chewy apricots, and chunks of sweet white chocolate, intensely almond-y with a kick of brandy to keep things interesting. 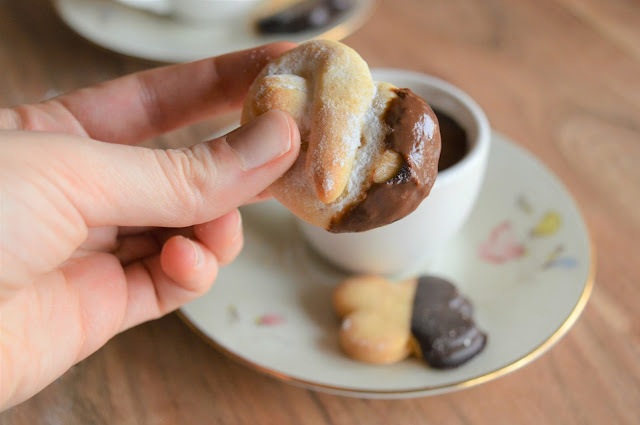 They are crisp, perfect for dipping in coffee, but not overly so as some biscotti/cantucci tend to be, with a softer inside. My mom makes them every Christmas, without fail, and I can't imagine The Best Day of the Year without them. They get the stamp of approval from our 15 year old beagle Snoopy, too, who came to investigate as I was photographing the cookies. 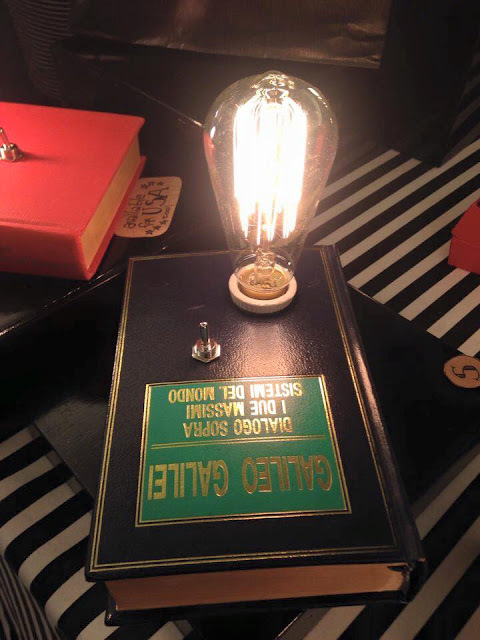 I'll be back soon with a New Year's recipe or two, plus a post on a trip to New York City. In the meantime, Happy Holidays and happy eating everyone! 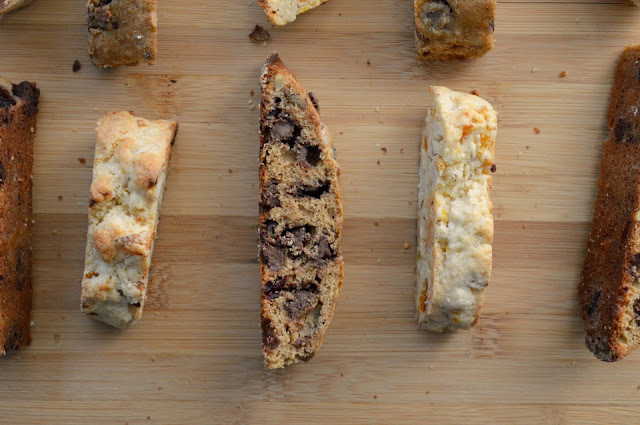 A couple of notes: Fun fact: Non-Italians know this sort of cookie as "biscotti," but their proper name is actually cantucci (biscotti simply means "cookies" in Italian). 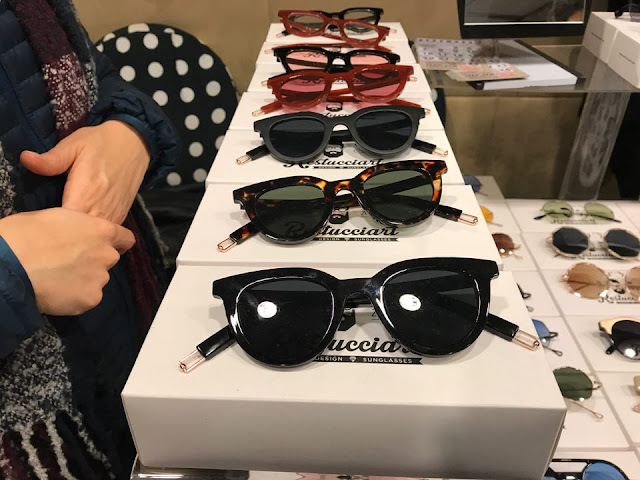 They originally hail from the Tuscany region of Italy. 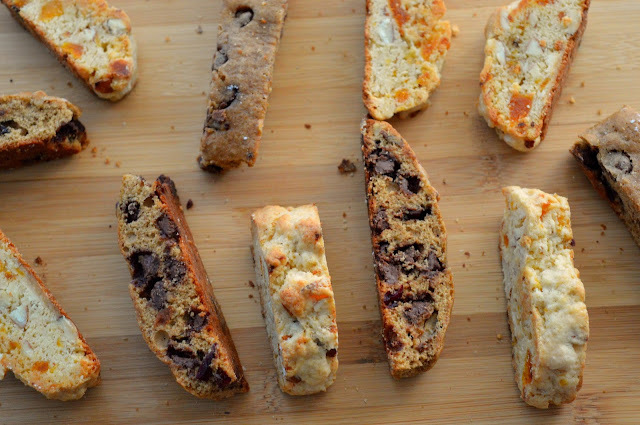 We baked a batch of Espresso, Dark Chocolate, and Dried Cranberry Biscotti (or cantucci) to go along with these -- you can get the recipe here where they go by Cappuccino Chocolate Chunk Biscotti. If you'd like, you can substitute any liqueur, dried fruit, or chocolate you'd like for the apricot brandy, apricots, and white chocolate. These are easiest when made with a food processor, but can be made without one, too; whisk together the dry ingredients, then work the butter in with your fingertips or a pastry cutter. Chop the white chocolate and almonds separately, and then add them to the dough by hand. 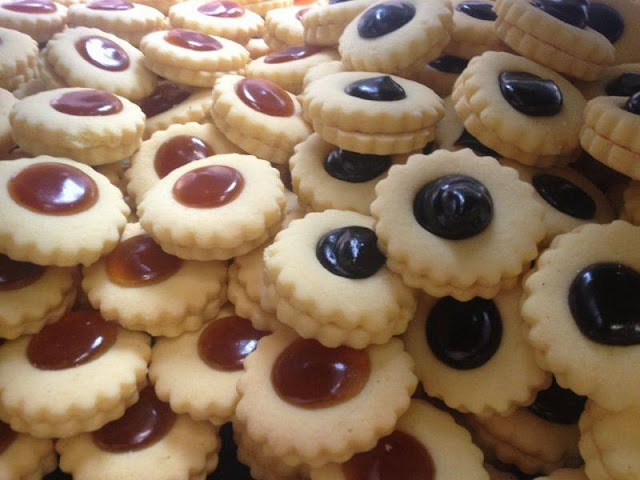 Note that these cookies stay fresh for up to two weeks when stored in an airtight container at room temperature. Looking for other Christmas appropriate bars or cookies? I've got these Double Chocolate Chunk Cookies, these Magical, 5 ingredient Peanut Butter Cookies, these Dark Chocolate Coconut Macaroons, these Brown Butter Chocolate Chunk Cookies, this Shortbread, these Chocolate Chip Cookies, and these Peanut Butter Sandwich Cookies. Line a large cookie sheet with lightly buttered aluminum foil and st aside. Combine the butter, flour, ginger, baking powder, sugar, and salt in a the bowl of a food processor, and ingredients in processor and process until the mixture takes on a sandy consistency. Add toasted almonds and chop coarsely, using 6 to 8 on/off turns. Add white chocolate and process until chopped. In a large bowl, whisk together the eggs, brandy, and almond extract. Add the flour mixture and stir until a dough forms, then stir in the apricots. Beat the eggs, brandy and almond extract to blend in a large bowl. Add the flour mixture, apricots, and stir until a dough begins to form. Cover the dough and refrigerate for 30 minutes. Preheat the oven to 350 degrees Fahrenheit (170 degrees Celsius). When the dough has chilled, turn it out on to a clean floured work surface and shape it into a log about 2 inches wide. Transfer the log to the prepared baking sheet and refrigerate for another 30 minutes. Bake the dough until golden, about 30 minutes. Transfer the baking sheet to an oven rack and let cool completely. Reduce heat to 300 degrees Fahrenheit. Cut logs from sides of pan if necessary. Transfer to work surface. Using heavy sharp knife, cut each log crosswise into 3/4 inch wide slices. Arrange half of cookies cut side down on cookie sheet. Bake for 10 minutes. When the 10 minutes are up, gently turn cookies over and bake 10 minutes longer. Transfer cookies to racks. Repeat baking with remaining cookies. Cool cookies completely before eating. Makes about 35 cookies. Last but not least, Rosemarie over at Turin Mamma will be preparing spätzle from the North of Italy, as well as panna cotta for dessert. 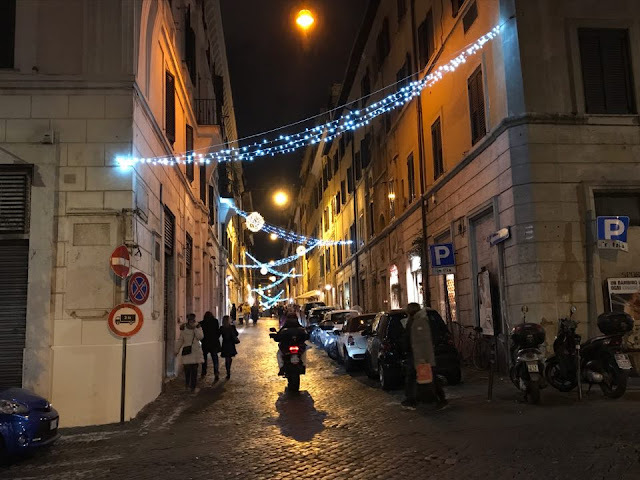 Let's jump a moment from December 2017 to December of 2009, all the way back when I was a student abroad in Bologna, Italy, and wrapping up my first semester of university. 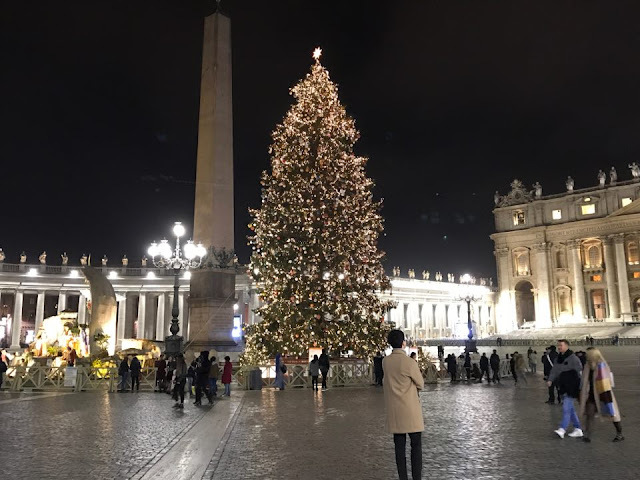 By the time the holiday season rolled around, I had been living in Italy, a foreign country, for nearly five months, and flourishing, if I don't say so myself -- my Italian language skills had improved considerably, and I had made Italian friends (!!!) plus friends from my language school, from all over the world. 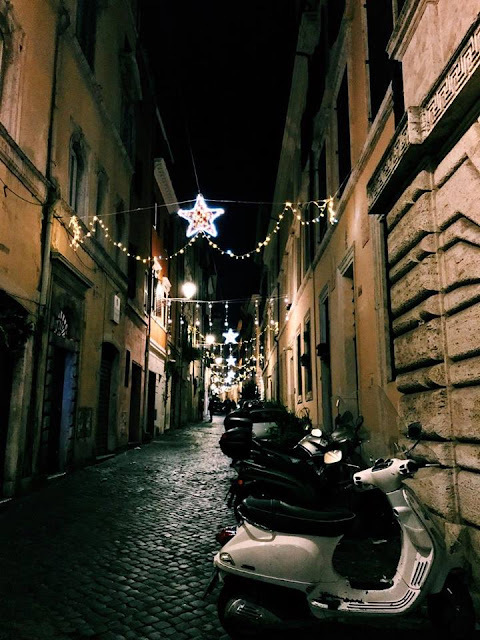 Exciting new friendships aside, I had passed all of my first semester exams at the University of Bologna, started an Italian cooking course, and Christmas, my favorite holiday, was just around the corner. Bologna -- by then crowned my Favorite Place Ever -- rose the the occasion, and was decorated beautifully for the holidays, complete with a little ice skating rink and Christmas market in the piazza. 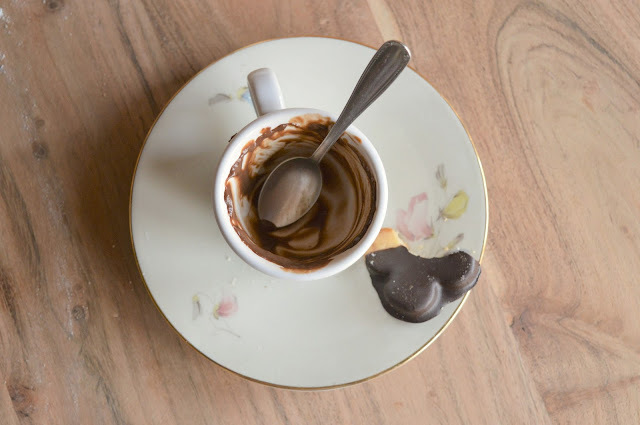 It was an exceptionally exciting, joyful, and happy time in my life -- as my whole year in Bologna was -- made even better by a single discovery: Italian hot chocolate. 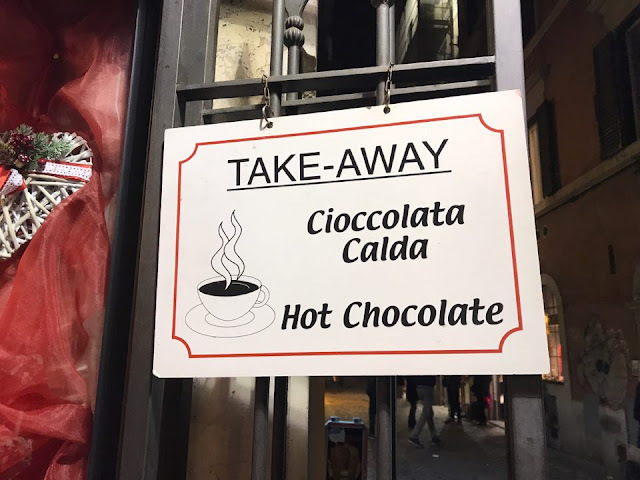 I discovered Italian hot chocolate, or cioccolata calda on a snow-dusted December evening in a cafe on Via Indipendenza, the city's main street. 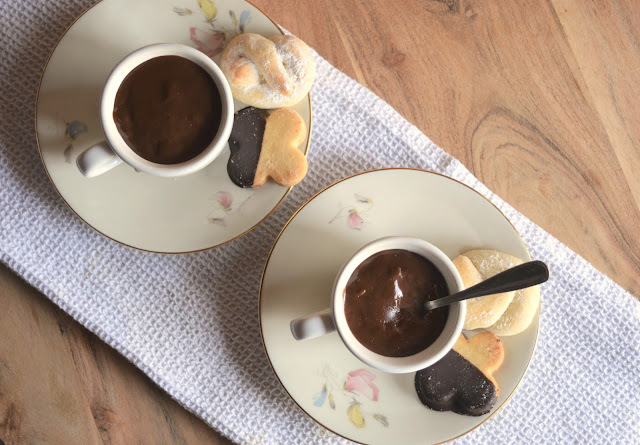 I was with my sister, plus our friend Anna (who you may remember from this post and this one) and we all ordered cioccolata calda with a few cookies on the side. 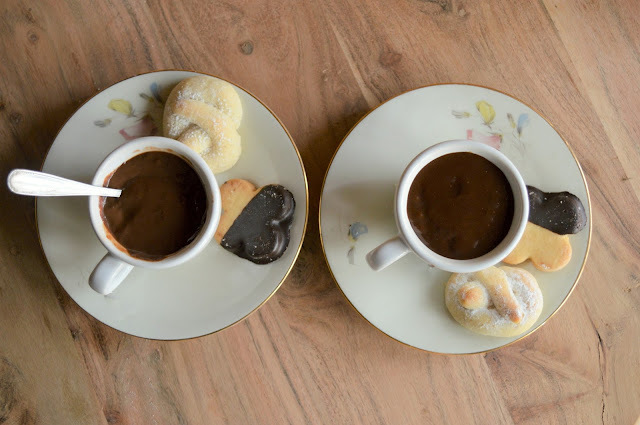 I placed my order without much thought -- after all, hot chocolate was hot chocolate, not much of a novelty, something that, unlike cornetti or tigelle, I had already been acquainted with in the U.S. The hot chocolate I was expecting had a present but sometimes subtle chocolate flavor, with a thinner consistency, and was served in a big mug and topped with mini marshmallows, if you were lucky. Though you could get it homemade, it was often made from a mix, which didn't detract from it -- it was comforting and tasty nonetheless. But this was not that. The hot chocolate that was ushered to our table, was curious, different, exotic. Upon further inspection, we discovered it was thick, so thick it was served with a spoon because it toed the line between eatable and drinkable, and was bittersweet, so much so that adding a teaspoon of sugar or two wasn't unreasonable. 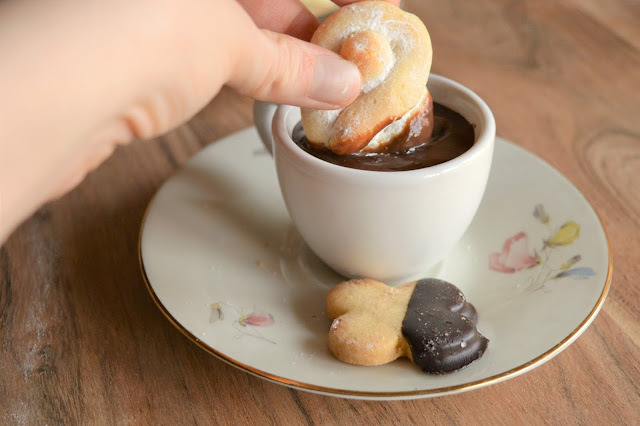 It was served in smaller cups that took into account its richness, topped with a dollop of unsweetened whipped cream to cut the darkness of the chocolate. It was, in short, divine, yet another wonderful thing I'd discovered about Italy, and so different from what I was accustomed to -- cioccolata calda, I decided, was American hot chocolate's exotic, wiser, slightly moodier older sister, one who had lived a year abroad in Europe, studied philosophy, and spent lots of time writing, or thinking deep thoughts. I was happy to have met her, and we became good friends during my colder months in the north of Italy. 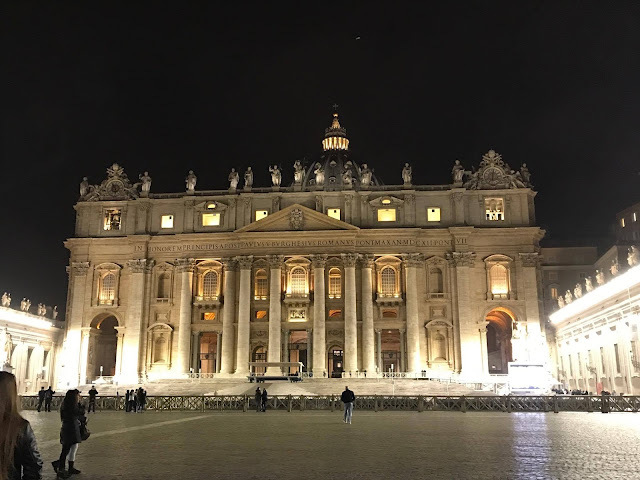 Our friendship remains strong today, in Rome, where the weather is not exactly snowy but can be at its worst gray and rainy, and cioccolata calda is still welcome. 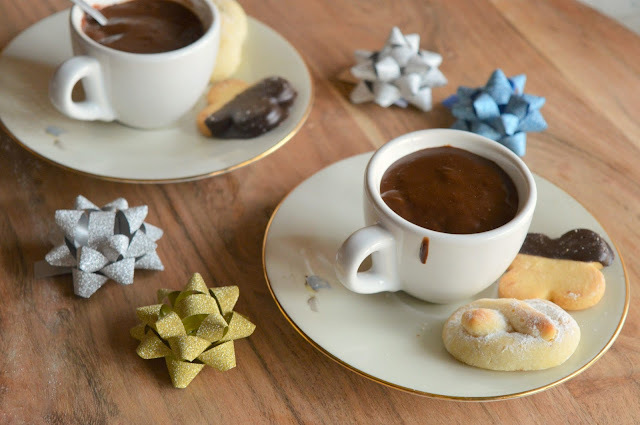 A couple of notes: Unlike American hot chocolate, where you're like to get a whole mug-ful, Italian hot chocolate is much thicker, darker, and richer, so a small cup is all that you'll really need -- I used particularly small cups for serving as a matter of preference, but feel free to use whatever you have on hand. 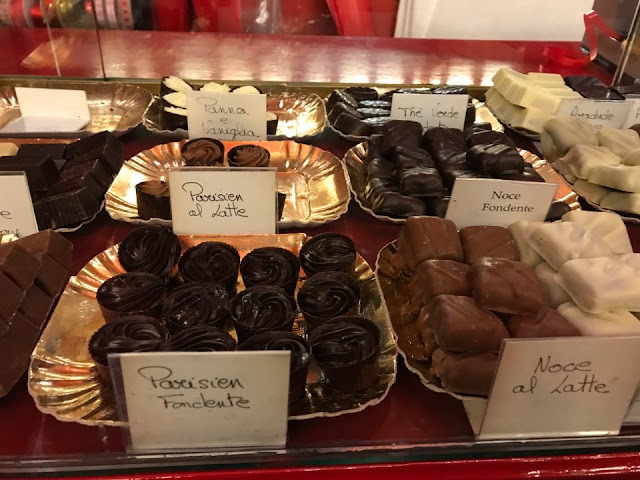 There is a good amount of cornstarch in here to ensure the cioccolata calda gets nice and thick -- one of my taste testers likened it to "thin chocolate pudding" -- but if you'd like yours a bit thinner, feel free to decrease the cornstarch to 16 or so grams (2 tablespoons). Do sift your cornstarch and whisk the milk in well and continuously to avoid any lumps as well. This is really delicious with unsweetened whipped cream -- I didn't have any on hand when photographing this and regretted it! Put the cocoa powder, vanilla, cornstarch in a medium pot and whisk together. Add the milk a little at a time, whisking the whole while, until everything is smooth and no lumps remain. Place the pot on the stove over low heat, and whisk everything together constantly. When the milk/cocoa mixture begins to bubble and then add the semi-sweet chocolate and whisk until the chocolate is melted and smooth. Let the mixture cook for about a minute, or until it becomes dense. Spoon into cups, top with a dollop of freshly whipped unsweeted whipped cream, if desired. Serve immediately. Serves 4-6, depending on how large your serving mugs or cups are. You guys! There are just 12 days to go until Christmas, and I don't know about you, but things have been pretty hectic around here -- on top of the usual Christmas shopping, I've been lucky enough to have friends in town who I rarely see, visiting from Mexico, Denmark, and the U.K. I've been doing lots of baking -- gingerbread, homemade hot chocolate, recipes to follow! -- and I'm looking forward to a much needed break from my current job. All things considered, the weeks leading up to The Best Day of the Year have been darn pretty nice. 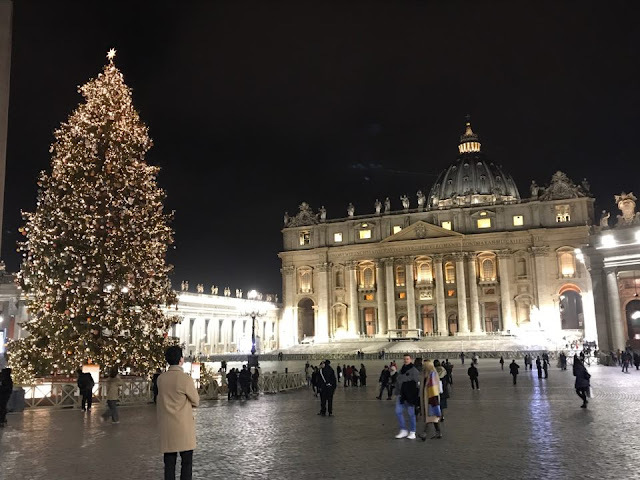 In the spirit of Christmas giving, I wanted to share a few of my pre-Christmas traditions and activities I've been busy with (spoiler: they're nearly all food related, but you could've guessed that, right?!) 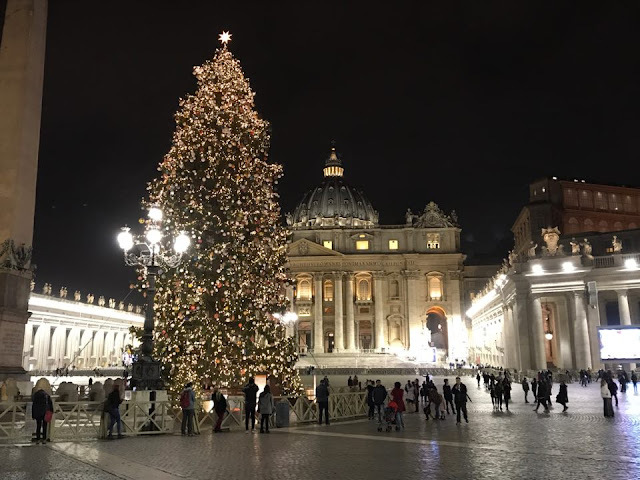 For those of you also living in the Eternal City, consider these my suggestions, and for those of you elsewhere, here's a glimpse at the holiday season here in my adopted home. P.S, photo credit for the above photo goes to the lovely Sheza Tariq! 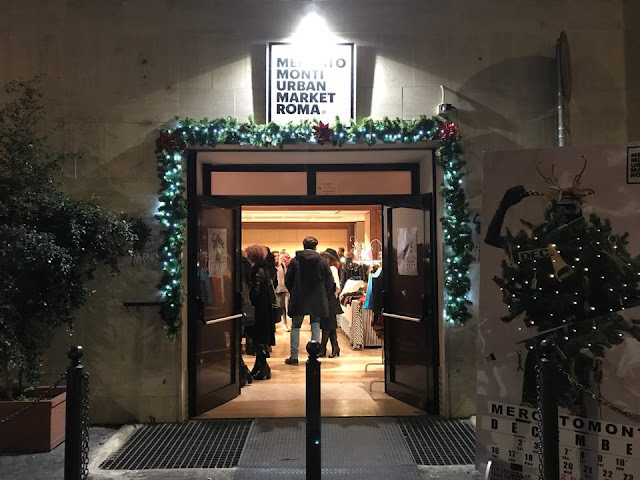 Located in the Monti neighborhood (not far from the Coliseum) Mercato Monti is my first stop when I start my Christmas shopping, and should be yours too. 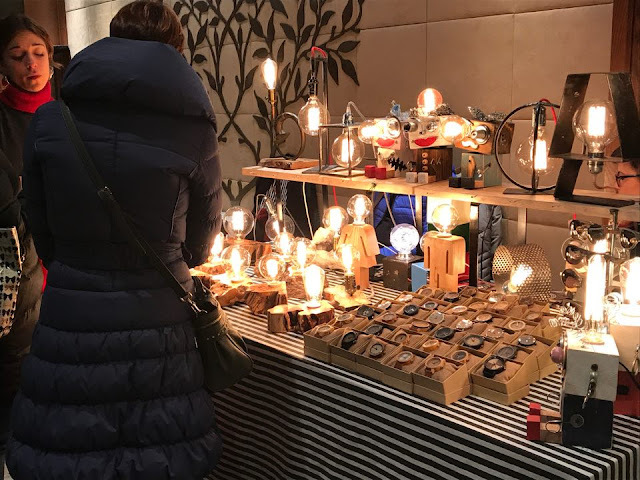 In keeping with the artsy hipster vibe of the neighborhood, the market is full of artisans and vendors selling everything from jewelry to scarves to dresses to jackets, not to mention bags, T-shirts, and vintage sunglasses, plus my favorite, the book lamp, a lamp with a bizarre looking light bulb made out of a secondhand book (see below!) 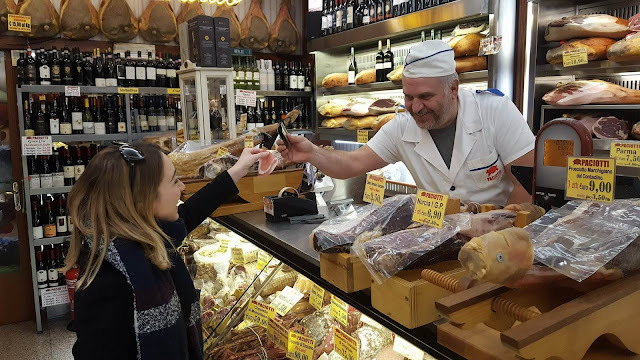 If all the shopping makes you work up an appetite, do as I do and stop at Zia Rosetta around the corner for some of the best sandwiches in Rome. 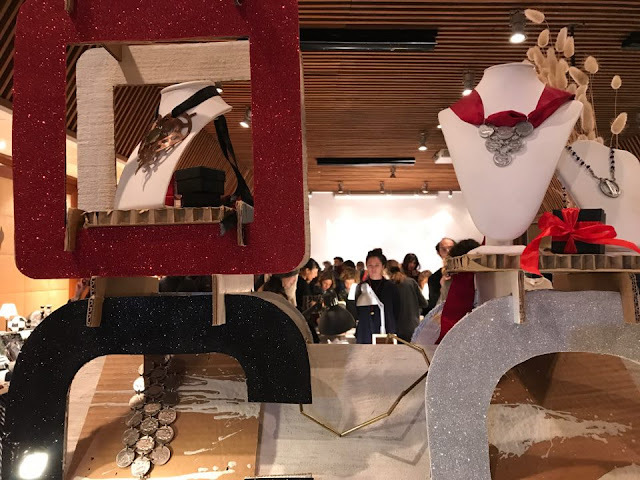 Photo credit for above photo goes to MercatoMonti. 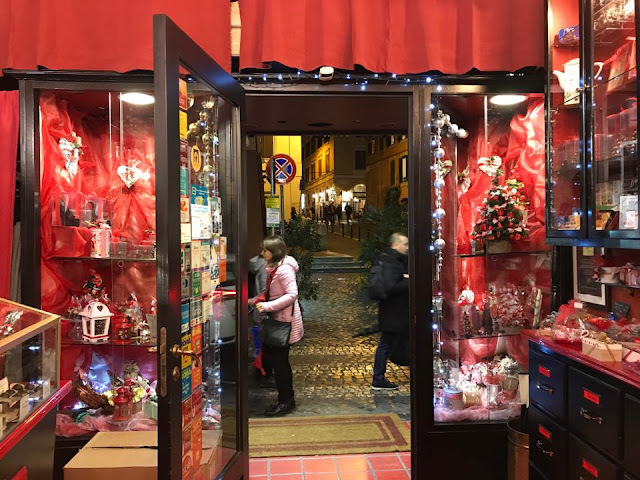 I've said it before and I'll say it again: the best gift is an edible gift, and since my family deserves nothing but the best, Paciotti -- a family run specialty food store -- has been part of my holiday ritual for as long as I've been in Rome. 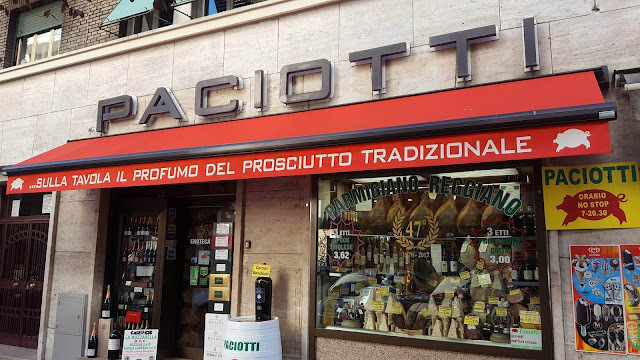 There is no better place to stock up on cheese, balsamic vinegar, wine, limoncello, or olive oil to bring back to my family in the states, and Paciotti will vacuum pack the cheese for you, no problem. My 96 year old grandfather makes out particularly well in this, with enough Parmesan to last him months. 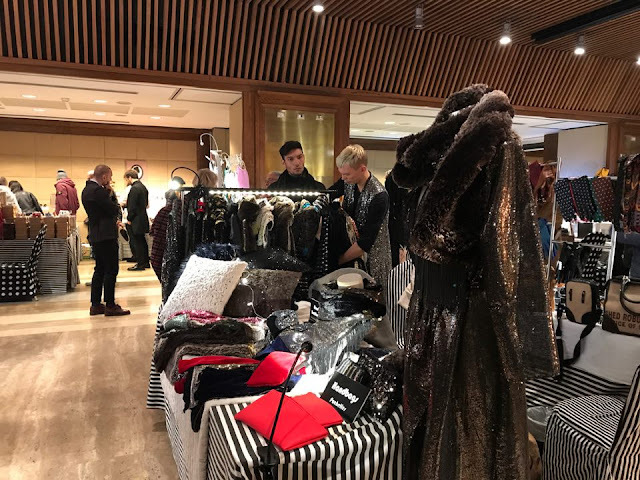 Bonus: the staff is incredibly helpful and knowledgeable, and free samples are likely. 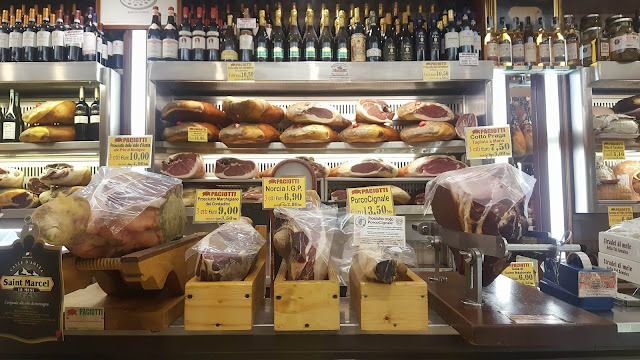 Remember: don't bother buying prosciutto or any other kinds of salumi to bring back home with you, as it cannot leave the country and will be confiscated at the airport (I learned this the hard way). 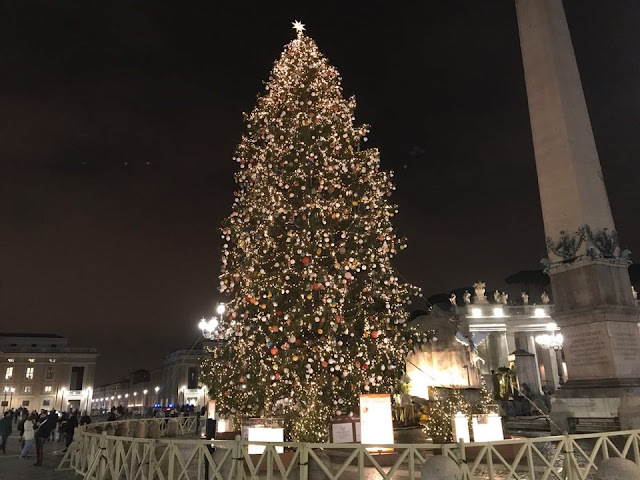 Christmas in Italy is simultaneous with panettone, a traditional sweet bread studded with raisins and candied fruit and topped with sugar and almonds. Panettone requires a lengthy preparation process leading up to the actual baking, and I've not yet found the time or concentration to attempt it. No matter -- Nero Vaniglia in Garbatella makes incredibly delicious from scratch panettone, which you can buy whole, or in a mini version, or just by the slice. 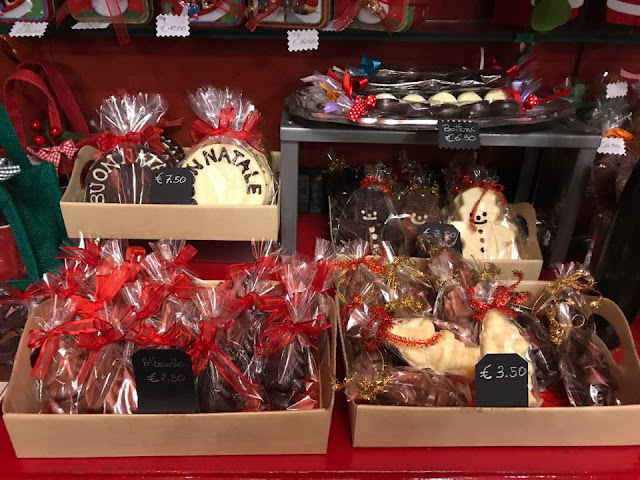 If you're not in to panettone, no worries - the bakery has all sorts of pasticcini (little pastries) like tiramisu, mont blanc, and croquembouche, small enough to guarantee that you can try more than a few. 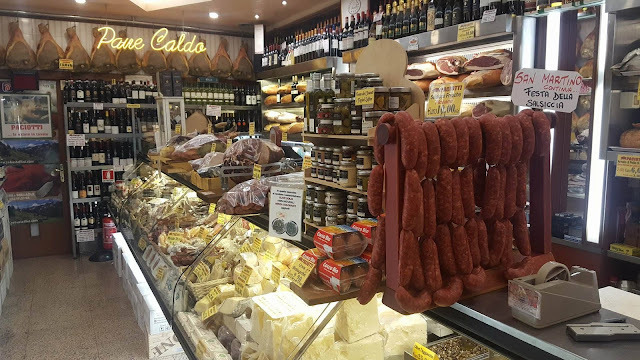 Bonus points for the cucina a vista, or open style kitchen where you can see whatever head baker and owner Giorgia Grillo is whipping up -- when we stopped by, she was working on homemade cornetti. 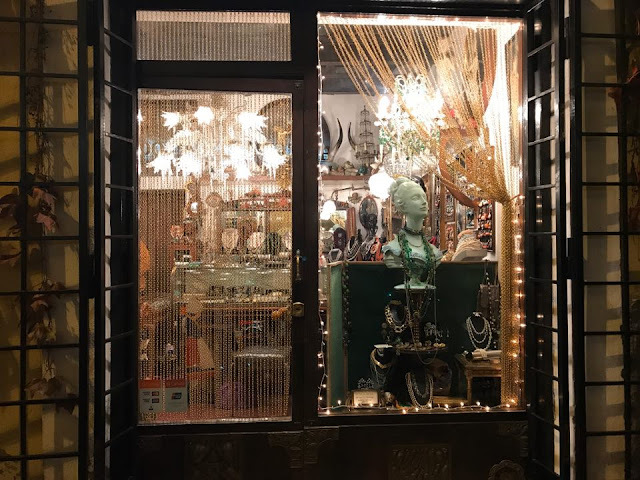 Hours: Tuesday-Saturday, 6:00-2:00. 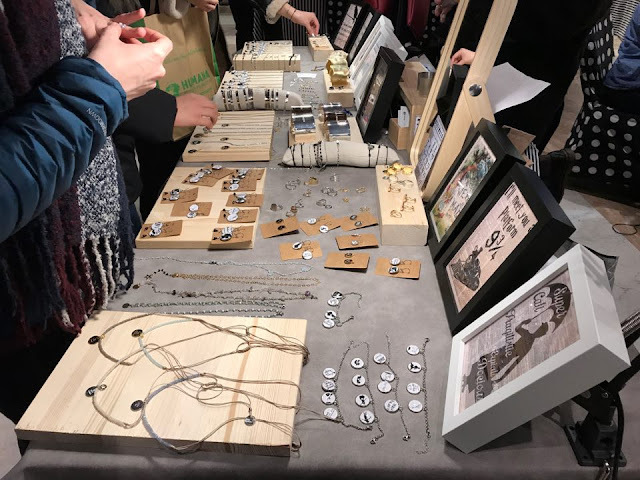 Sundays: 7:00-20:00. Its not Christmas without Christmas cookies! 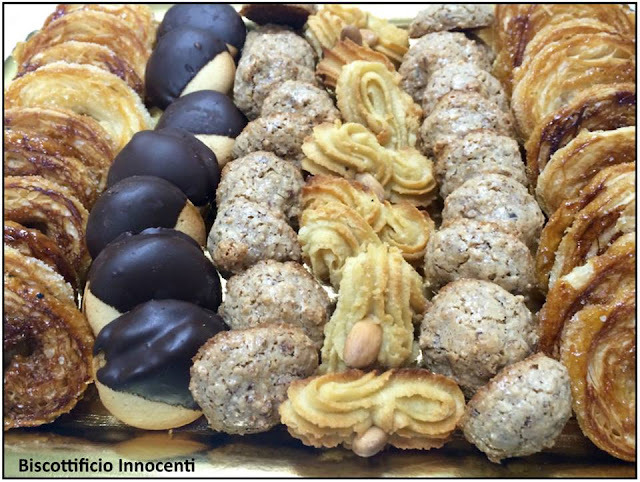 Gingerbread cookies and sugar cookies (holiday staples in the U.S) aren't really a thing here, but I can't say I miss them much, because I have Biscottificio Innocenti. 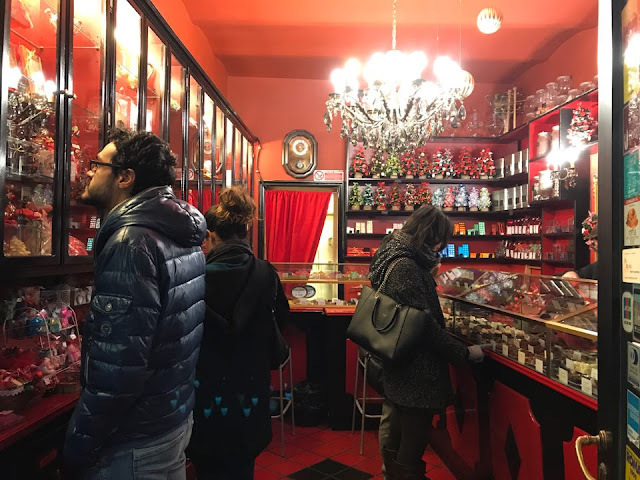 Located in the picturesque, postcard-like neighborhood of Trastevere, this family run cookie shop has staying power, having been run now by four generations of women. 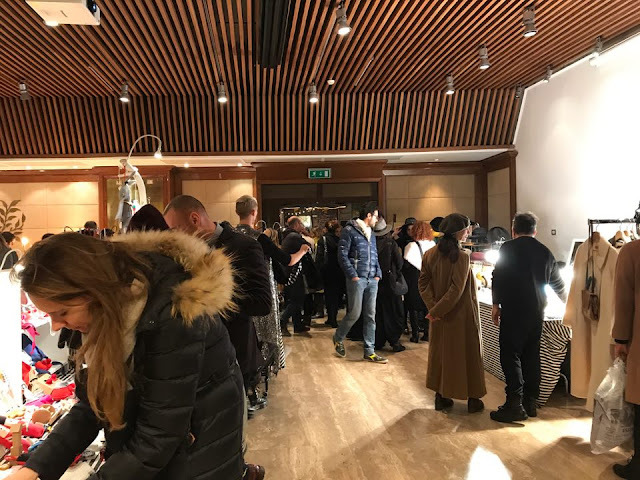 They bake up the best cookies in the capital, everything from delicate sandwich cookies (filled with Nutella or jam) to super lemon-y limoncini to feather-light meringues to vanilla cookies dipped in bittersweet chocolate. 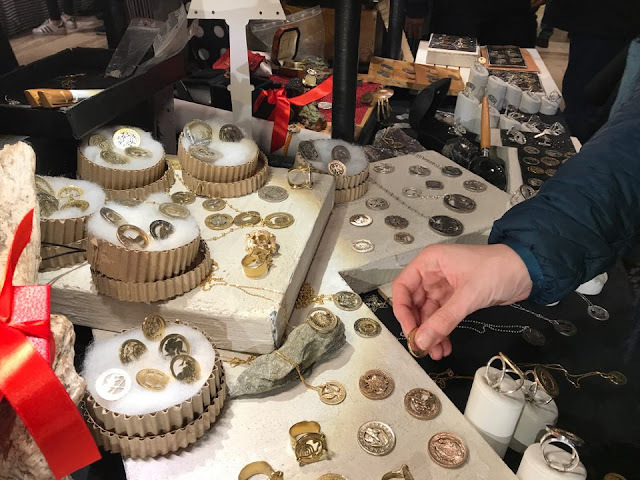 The cookies at the top of my Christmas list, however, are brutti ma buoni, crispy, chewy, meringue and hazelnut cookies that don't look like much (the name translates to "ugly but good") but are downright divine. 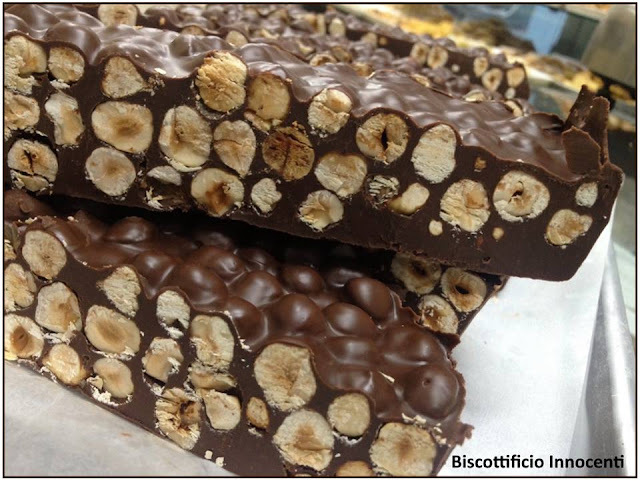 If you go around Christmastime, you'll also find torrone (nougat with hazelnuts, almonds, or pistachio!) and the traditional homemade panettone. 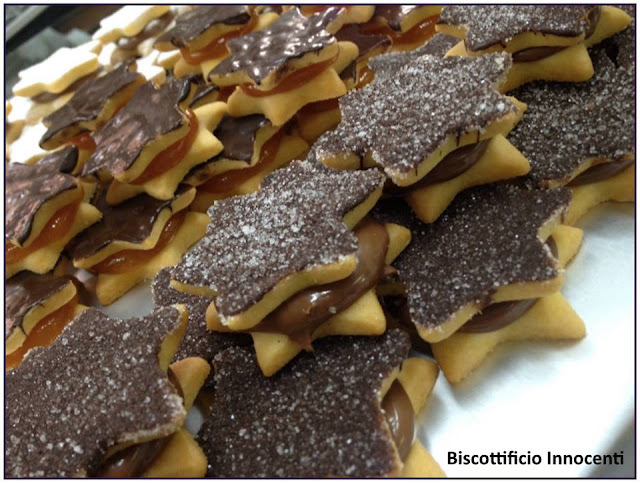 Picture credit for this one goes to Biscottificio Innocenti themselves -- thanks guys! 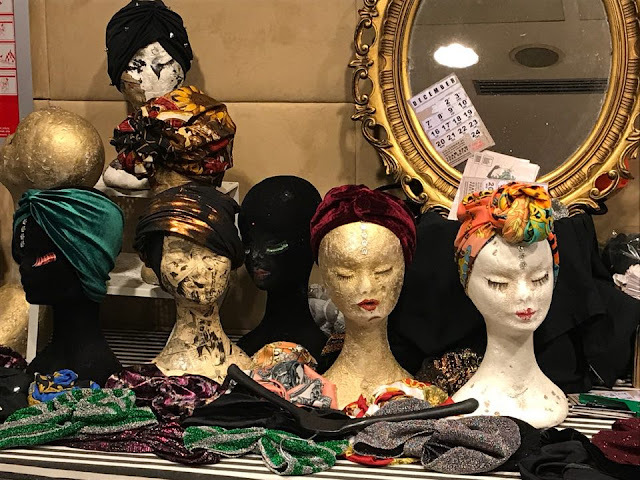 Hours: Monday-Saturday, 8:00-20:00. 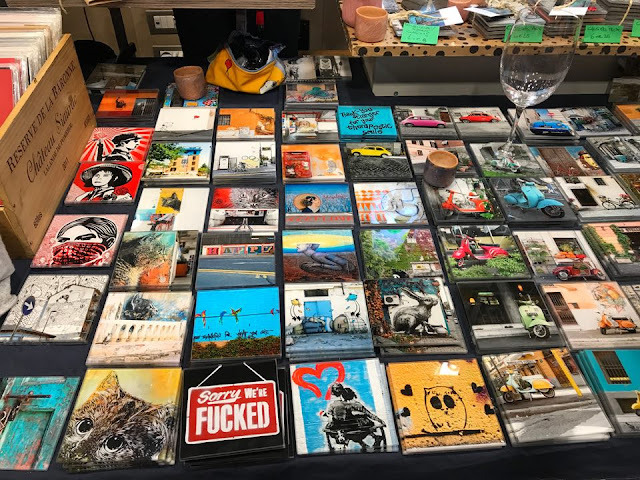 Sunday: 9:30-14:00. 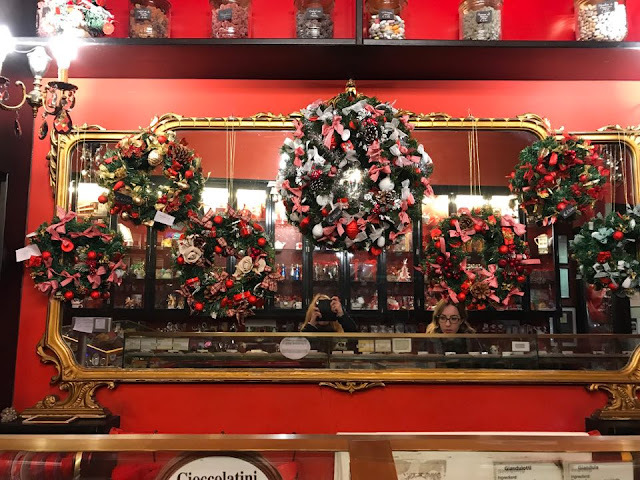 This holiday season, I highly, highly recommend you pay a visit La Bottega del Cioccolato, a tiny chocolate shop located again in Rome's Monti neighborhood. The chocolate assortment here is extensive and impressive -- my favorites are the white chocolate/pistachio chocolates and the hazelnutty cremino -- and a box of these makes a (delicious) gift for colleagues and friends alike, not to mention the perfect hostess gift at your many holiday parties. 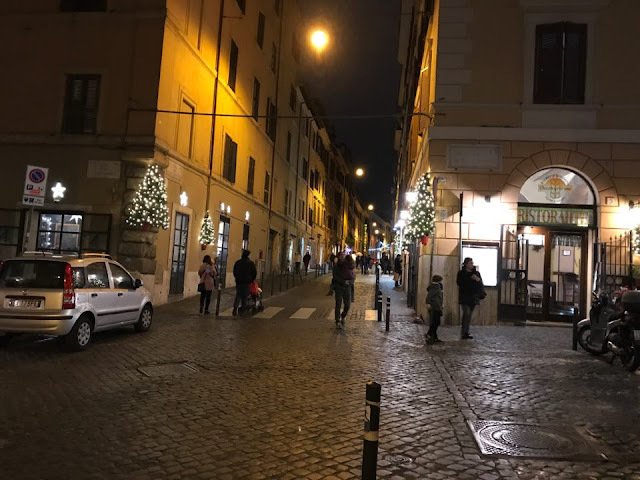 That being said, you could also do as I do and buy a little bag of assorted chocolates to eat as you stroll through Monti, an early Christmas gift to yourself. 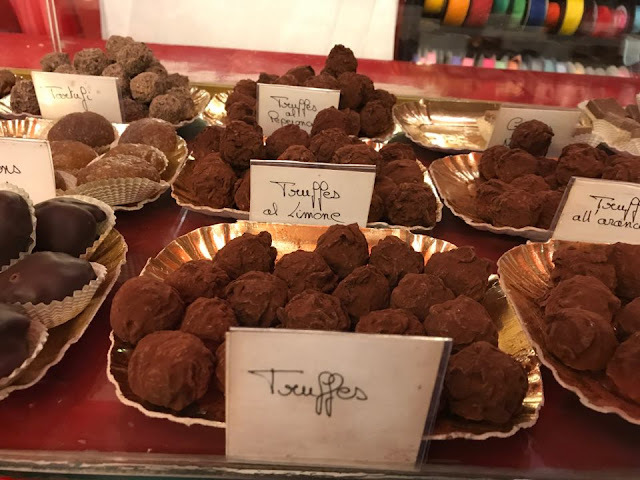 Bonus: if you want to eat your chocolate and drink it too, the Bottega sells fantastically rich, deeply dark hot chocolate as well, not for the faint of heart. 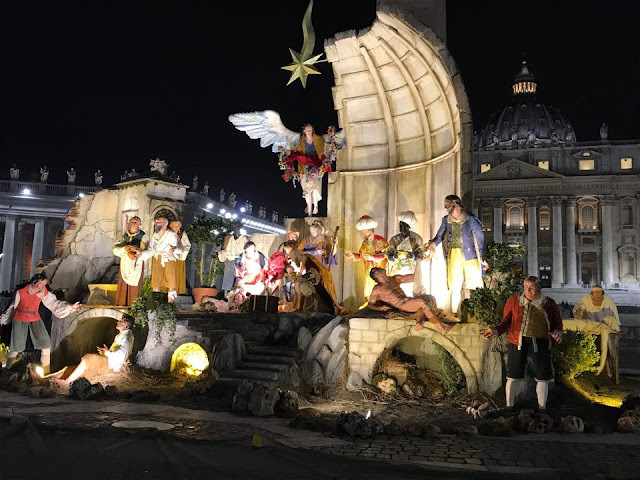 A walk around St. Peter's never gets old, no matter how long you've been living in Rome, but I must say its particularly special around Christmas, when the albero di natale (Christmas tree) and presepe (Nativity scene) are up. 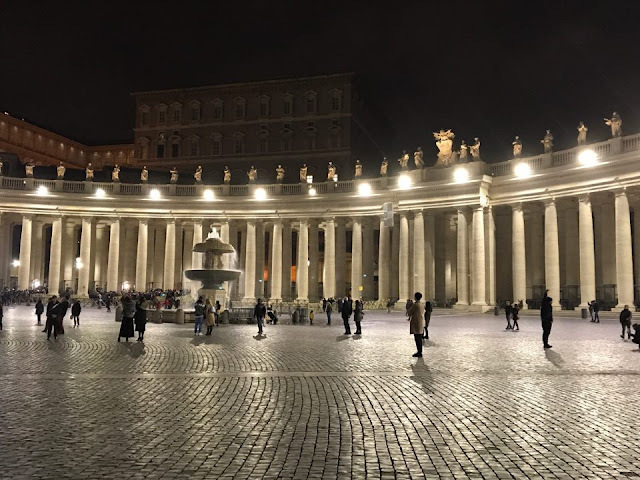 Illuminated against the basilica, its a sight to behold, and if this doesn't get you feeling Christmas-y, well, I don't know what will. I'll be back next week with some more festive recipes, plus I'll be traveling back to the U.S with a stop in New York City. Posts to follow.